Marcin Bielski, Prawdzic coat of arms (1405-1575) who was a Polish nobleman, soldier and prolific XVI century author in Jagellonian Poland (union of Crown of Kingdom of Poland and Grand Duchy of Lithuania under a king from the Jagiellonian Dynasty), wrote and then published the first history of Poland entirely in Polish language, titled ''Kronika Polska Marcina Bielskiego'' (Marcin Bielski's Chronicle of Poland) (part of the 'Kronika Świata' - Chronicle of the Universe). 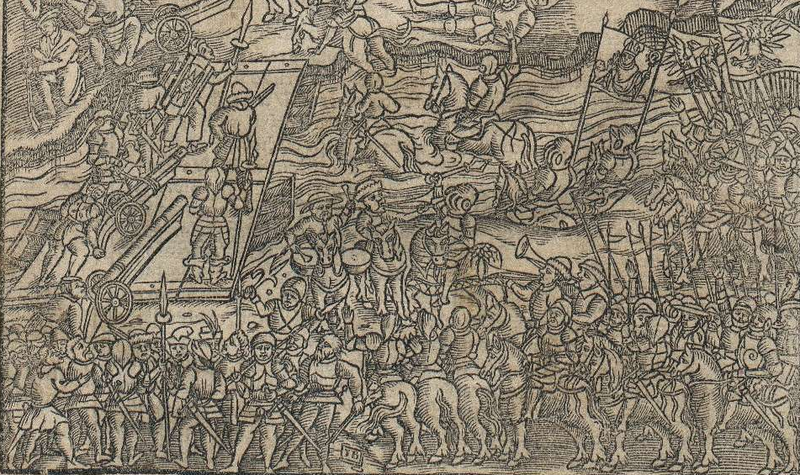 The book was published with some woodcuts within the text. Joachim Bielski, son of Marcin, continued his father's work and published updated version in 1597 - eg a digital version from the Jagiellonian University library. 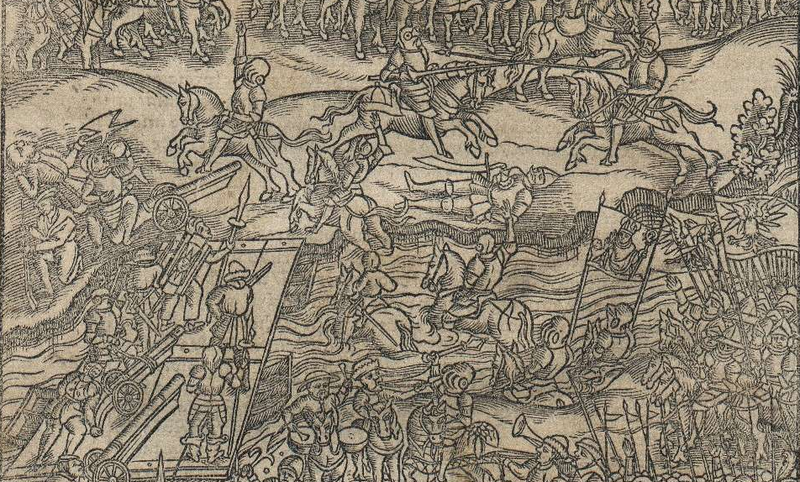 One woodcut illustration shows the battle of Orsza(Orsha), a pitched battle fought between the forces of Jagiellonian Poland and Grand Duchy of Muscovy, And today, Septemeber 8 2014, is the 500 years anniversary of that famous battle, however the official media in the Republic of Poland (Rzeczypospolita) are quite silent on the subject - how sad ! Perhaps there is more in the Lithuanian, Ukrainian or Belorussian media? We all share a common history with one another, albeit the Lithuanian government, member and signatory of EU treaties on minorities etc) has been discriminating against the Polish minority in Lithuania in breach of international law, EU laws and agreements with the Republic of Poland. Ruthenian prince and hetman Konstanty Ostrogski, Ostrogski coat of arms, was the victor of this engagement, worth noting that the was one of the most important and successful Jagiellonian Poland commanders. Polish National Museum holds a famous painting showing the very battle. 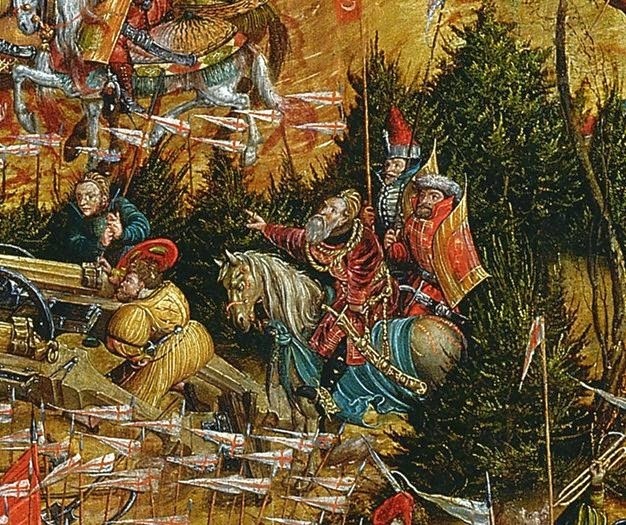 This Northern Renaissance painting is a veritable mine of information on the early XVI century Polish and presumably Grand Duchy of Lithuania military - including the early winged hussars who played not a small role in this decisive engagement on the Dnieper River (interestingly there were all together 3 battles fought in the Orsza vicinity and all victories of Polish-Lithuanian forces. Orsza battle AD 1514 has not been a subject of many works of art in the past, for some reason the battle was forgotten, and it was not a subject of literary works of fiction, sadly and generally speaking our Polish Jagiellonian XVI century, the great Golden Age in Poland's history, has not been subject of novels nor films (but for a handful of TV films on the famous international figures like Mikołaj (Nicolas) Kopernik and queen Bona Sforza). Portal Kresy.plkresy.pl has an article on the painting by Józef Męcina-Krzesz, painted circa 1884, on the subject of Orsza battle. The original painting can be found in Równe in Wolyń (Volhynia), today's Ukraine. The painting was published in a form of woodcut in old Polish art magazine Kłosy in 1885. A detail of the woodcut here. Gaited Horses in Fiore's Manuals - very interesting take on the fighting manual's various illustrations showing mounted combat and use of gaited horses in Medieval combat - very worth your while. And an intro to ambling horse in history - here . By the way I really love riding amblers/pacers like Paso Finos or various American breeds.